when it comes to the baby stuff, it’s all about the diaper issue. since bhumy is like a day old, we basically just used cloth diaper. not the old linen fold ones. but the cloth string one they made this days. it’s useful until he is like 2 months old, and bhumy start outgrow them. he basically kicking them off and pissed all over us sometimes in the morning, haha:D kadek as usual likes to wash them and i’m with the iron. bhumy wear his disposable diaper first time when he’s a week old and basically when we go out with him afterward. things are okay like that after 3 months when bhumy start wearing his cotton pants, but the next months, we’re in trouble when bhumy is always on the move so he couldn’t stay on his rubber matt. but i don’t want him to wear disposable 24-7. but like now, he even start to put his rubber matt into his mouth which made us have to keep it out of the way for good. luckily i solved them one day when i’m browsing the internet, where i accidentally found all size cloth pocket diaper. they totally rock. i’m totally converting to cloth diaper now, although i have to buy them one at a time coz they do seem cost a lot the first time and yeah, i only can buy them online. i got six of them right now (from racheline.com), which already cut the cost of buying disposable by half monthly. i’m looking to try other brand too, saving money to buy them for now. i need around 15-20 diaper to used them fulltime. each of them cost nearly 300,000 IDR, that’s why i have to save money for them, but for the long run they really really save money. 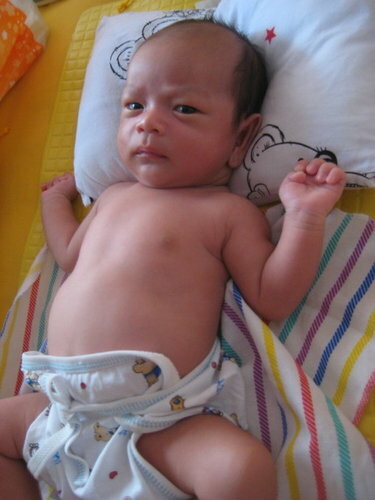 considering that i can spend nearly 500,000 IDR for disposable diaper a month lately (one pack a week, jeez). this is basically the disposable that fit bhumy right first time. they’re the thinnest in the market available (until i found goon diaper). they’re okay. they’re the new stuff from Pampers, turn out bad, they gave Bhumy diaper rash in his back. even though they are thinner than the pampers baby dry. they’re the best disposable diaper so far, with wetness indicator too. the thinnest ever. no problem with rash or anything. the downside is that i have to buy them in a baby shop. the best pull up pants, very thin, no bulky thing in the middle when it’s full. breathable too. i don’t like them, my baby don’t like them. they become really bulky from the first wetting. they’re allright, but for me sometimes they’re too bulky. and rather expensive too. they’re only usefull until bhumy 2 months old. after that they just don’t work and a lot of laundry. they’re okay until bhumy 4 months old, but after that, they just too thin for the increasing wetness and mass of bhumy. they’re great, never leak. although it might fit bhumy when he’s larger, seems a bit bulky for now and their insert are big (good to wear for an all night diaper), but they take time to dry. nice colour. never leak. better size insert, quick drying too. they fit bhumy the nicest so far and seems to be more breathable compare to wonderoos, maybe because they’re design for the tropical weather, great color and design. totally love them, buying them some more later. Previous Post happy b’day, jesus!